Until I started collecting microcomputers in late 2007, Atari systems were a complete mystery to me. My only familiarity with the model range was from drooling over advertisements in the early 1980s! I had never actually seen one in the flesh. I wanted at least one of these early 8-bit Ataris in my collection as I deemed them to be 'notable' contributions to early personal computing. Mostly I wanted an Atari 800. Acquisition of that venerable machine didn't eventuate but in the end I managed THREE other Atari 8-bit machines; An Atari 400, 800XL and 130XE. Having a classic computer is good but without software it's just a box. One thing I do with all my micros is to build up a library with the titles that the unit would have sported in the day. Most of this software can be sourced on the Internet. The challenge is to get those programs from there to the original machines! The solution in my case was the Atarimax Universal SIO2PC interface (USB version). I ordered this over the web about a year ago but only now have had time to assess it properly. The SIO2PC (opposite) is a hardware device which plugs in between the peripheral port of an 8-bit Atari and the USB 2.0 port of the PC. 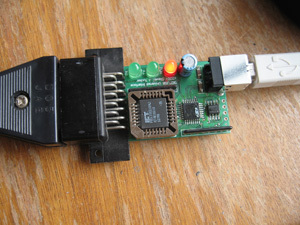 An RS-232 version also exists. Atari peripherals are daisy-chained from the computer so if there is anything else on the chain, like a disk drive or printer, the SIO2PC device is the last item on the daisy chain. My version of APE was a trial one. This means some features were disabled. First up I must say there are lots of things I didn't test. My main focus was file/disk image transfer. I played around with the printer emulation from Atari Writer and found it worked...kind of. One of the problems was that there are only a limited number of printers supported in Atari Writer itself and these particular ones were not emulated in APE. Text appeared in printer output files on the PC but it was not clean. I'm sure printer emulation would be fine with a straight text dump from BASIC. Nor did I test the modem emulation or PC-Mirroring features. Regarding file/disk image transfer though, the experience was very positive. 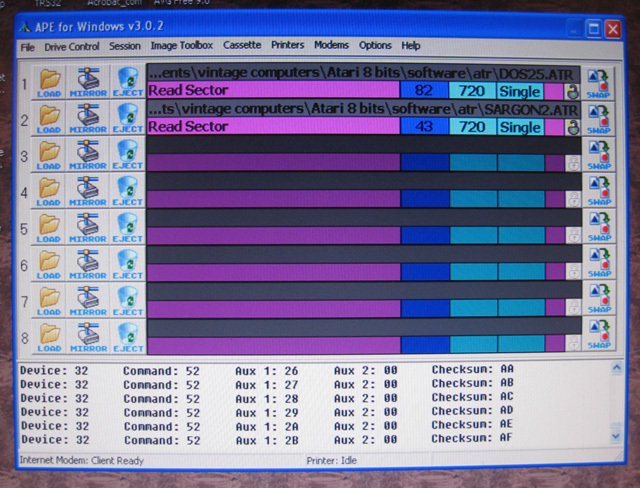 APE setup on my Windows XP SP3 machine was dead easy, and soon I had my Atari 800Xl booting off a DOS2.5 image disk. Once I got my head around how Atari DOS 2.5 worked I attached my real 1050 disk drive to the system and started moving files and images between the PC and the Atari floppy disks. Everything worked very smoothly. I managed to image my copies of Atari Writer, DOS 2.5 and a number of games. I couldn't image Microsoft Atari BASIC properly for some reason? I suspect the disk is copy protected. APE comes with it's own disk images for SpartaDOS and MyDOS 4.5x and their utilities. I didn't explore these but I found a few of the things I tried to do, such as using the My DOS 4.5x copy program for disk imaging (as suggested on the product website) required the registered version of APE. No matter, as DOS 2.5's copy disk function seemed up to this task anyway. The only real negative I found is the lack of documentation for the Windows version of APE. There are a few help files on imaging and setting up the interface but no comprehensive manual on the website. What is there is an "under construction" note. The DOS version on the other hand, has a full manual. This scarcity of documentation means that you have to try to figure out what's going on largely from the user interface only. It's not too difficult to do this but conceptual information, such as what is meant by "PC Mirror", and a high level explanation of the printer and modem emulation, is sorely needed. Another helpful piece of information would be a listing showing the differences between the registered and unregistered versions of APE. For example it's annoying to discover, right at the end of a disk image copy session using the MyDOS 4.5x utilities, that you can't complete the job unless you have the registered version! Setting up and organising my Atari software collection was fun and rewarding. In doing so I learnt a lot about the Atari disk system. This was something I wasn't familiar with, and it was a good chance to learn about Atari Dos 2.5. I like its simplicity. I learnt how to configure my 1050 disk unit as drive 1 to 4 and why you needed to hold the "Option" button down when booting with some disks (to bypass ROM BASIC I found). 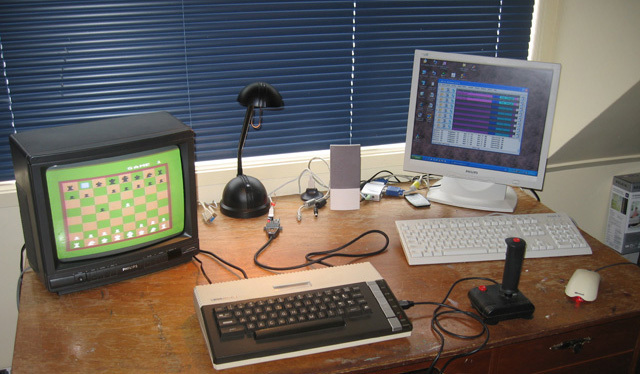 Hardware like the Atarimax Universal SIO2PC interface and software like APE keep vintage computing alive. Although the documentation could be better, I would recommend this solution to anyone wanting to enhance and maintain their 8-bit Atari systems. P.S. Earl Evans recently reviewed this item in his Retrobits Podcast. See show 129.